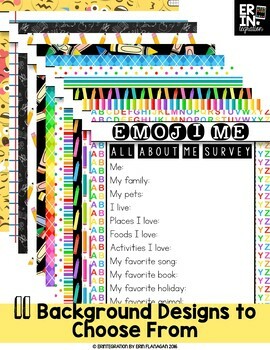 Emoji Survey for PicCollage on the iPad. 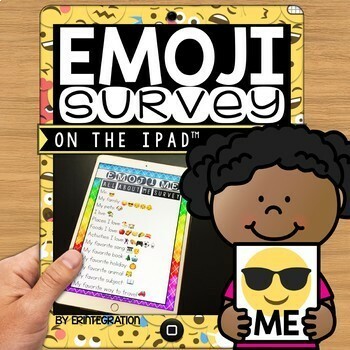 Easily integrate this low prep Emoji iPad® mobile digital device activity into your classroom. Students will first use the included QR code to download one of 12 image templates. 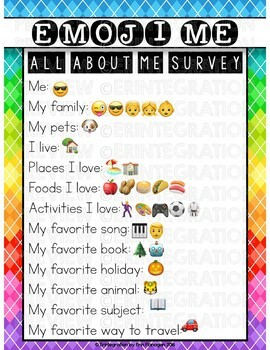 Next students will follow the included directions to set the image as a background in PicCollage™ to complete the All About Me survey questions. The catch? Students can only use Emojis to answer the survey questions! ★ 7 student friendly step-by-step visual direction pages for completing the activity independently. ★ 1 QR code that links to 12 high resolution survey images for students to select as their background image (UK / Australia spellings too!). 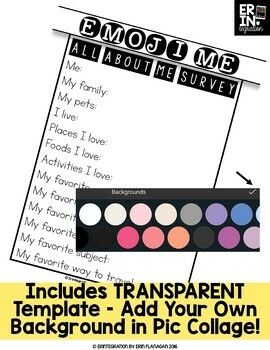 Includes a TRANSPARENT image so student can choose their own background in the app. ★ 1 Pic Collage single page reference sheet. ★ 1 set of mini iPads for sharing any images made via QR code. Print out the activity pages and distribute to your students or leave in an iPad center. You will need the free app Pic Collage™ and a QR reader app. Color Templates will also work on the app Seesaw™. Since my products all utilize free web and app resources, there may be rare times that the technology does not work as planned, which may be out of my control. Please be sure to message me in the Q&A section so I can assist you before leaving feedback. I use all of the apps that I base my packets on frequently and will update products as the apps themselves update. iPad and App Store are registered trademarks of Apple Inc. Erintegration is not affiliated with and has not been authorized, sponsored, or otherwise approved by Apple Inc.